Throughout the autumn of 1944, the Axis forces in the Carpathian Basin were fighting for their very existence. 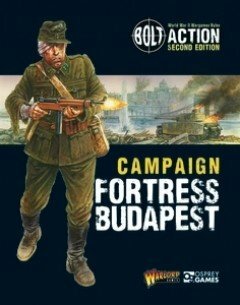 Campaign: Fortress Budapest will inspire and guide you through the entirety of this particular conflict and on to many more victories with your Bolt Action forces! The Siege of Budapest, the Soviet invasion of Hungary that led up to it, and the desperate German offensives to relieve the city covered kilometres of frontline; these battles lasted eight months and involved hundreds of thousands of combatants. Within the 168 pages of this impressive resource, the authors have squeezed in a variety of very different scenarios for players. Fortress Budapest is the latest Campaign expansion to Bolt Action Second edition. Whilst there is historical detail within the narrative, this volume is not a history book � it is first and foremost an impressive wargaming supplement. The intention of the author Bryan Cook and the team who put this book together was to provide a good mixture of scenarios, new units, and new rules whilst still giving some historical background for context. Some previously published rules and units have also been reprinted � this is to save players the expense of buying additional books for content which is vital to this volume, but might form only a small part of other books. Packed with history Fortress Budapest contains complete scenarios, additional special rules, army lists, new units and of course the all-important complete theatre selectors.